Wondering what to do on New Years Eve? Use tips from TipTop to ring in the New Year | TipTop Technologies, Inc.
← Need last-minute holiday gift ideas? TipTop personalizes the ideas, so you can buy the perfect present! Whether you plan to celebrate the end of 2010 in style or do the 2011 Happy New Year table dance, TipTop offers up top tips, people & perspectives from social media to help transport you wherever you may want to go, no matter where you are on New Year’s Eve. New York has the ball dropping in Times Square. Paris has fireworks on the Champs Élysée. London’s festivities include Big Ben’s chimes & a splash in the fountains. Tokyo hosts throbbing J-rock superclubs. Sydney has its Harbor Bridge fireworks extravaganza. Sao Paulo’s Reveillon parties mark the beginning of the summer season. Find out how people are feeling as they ring in the new year, what new years resolutions they are making, & what’s going on in cities across America New Years Eve 2010. In San Francisco for example, I found out that on New Year’s Day the city of San Francisco is going to reward you with a ticket-free day of parking. 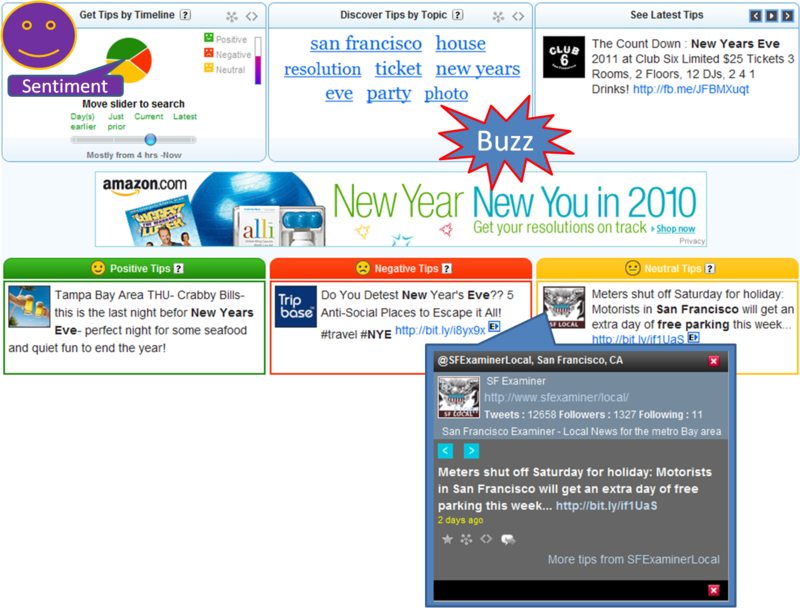 To find out the New Year’s sentiment, conversation buzz or the best New Years Eve tips for your neck-of-the-woods, enter your NYE topic of interest on TipTop and “Pick Location” or click “Add City” to get the current tips. Have a Happy New Year & a Tip Top 2011! FeelTipTop.com Why? Because life happens in real-time! It’s really what I like about fast food burgers. The meat is not livery.